DECATUR, Ill. (WLS) -- It took 50,000 Lego bricks, more than 2,500 images and one Illinois doctor. Watch this castle replica built over six weeks in this three-minute time-lapse video. Bob Carney, 72, of Decatur, Ill., who has built 146 castle replicas, set out to recreate the Rhuddlan Castle of Wales. 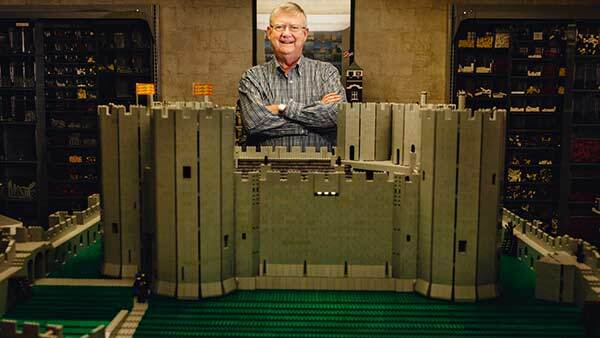 This is his largest UK castle to date and measures 7 feet by 5 feet. "When I decided to start modelling castles using Lego in 1986, I started considering possible projects and the castles of Wales came to the top as the best in the world," Carney said. In May, Carney and his wife Judy will embark on a mammoth tour of the historic sites of Wales and England to see some of the castles he's built. They'll travel more than 2,700 miles to visit 74 historic sites over just 23 days. "When Judy and I enter Wales I am going to feel like a child in a candy store with a pocket full of change," Carney said. Carney is currently creating a model of Caernarfon Castle, which will use around 60,000 bricks. The model will be displayed at a Chicago Lego exhibition this summer. Cadw, the Welsh government's historic environment service, teamed up with Carney to create and promote the time-lapse. On his website, Carney said he's always had a fascination with Medieval history. "I built my children a play castle from redwood, using newsprint rolls for the towers, complete with drawbridge and knights. I have also been a Lego builder since the early 1970s, when my wife and I got our children Kraft Lego sets," he said. Carney says he's been a dermatologist for 36 years. He also enjoys golf. "I used to build castles from April to December, then spend the winter months in Illinois designing future castle projects, but after my dear 'Lego-suffering' wife and I redecorated our basement to fit my hobby - and with the advent of digital cameras, now I design and build year-round without regard to the season," he said. He said before the Internet, he would go to libraries and look for books and pictures of the castles he hoped to build and photocopy them. "Once I had gathered enough information about a castle, that castle's pictures (were) moved to the short stack of castles to be drawn in Lego 'minifig-scale' - the size Lego knights and ladies could live in," Carney said. Carney says his castles all require thousands of bricks, but some are much larger than others. "Small Scottish and Irish towers such (as) Affleck or Clara could be built by most anyone with lots of Lego bricks, since a huge number of gray bricks isn't needed. On the other hand, I have a drawer full of castles, such as Caernarvon (Wales) and Burg Eltz (Germany), that I have designed but are still too large for even my extensive collection of bricks! But my collection grows, and eventually I'll have enough bricks," he said. Carney said his largest castle built today - a Bavarian castle - required 52,461 Lego bricks "roughly broken down into 23,815 white bricks, plates, etc; 8789 old dark gray Lego; 3205 black slopes (for the roofs); and 16,652 other colors (infrastructure, gatehouse, etc.) 271 support and grider bricks, and 166 BURPs and LURPs were utilized." Carney says to maintain his usable supply of Lego bricks, he does have to dismantle every castle after it's been "carefully" photographed.